Brave the grave at Howling Fun, a 5-reel slot game with monstrous rewards. Dracula gives free spins & the Devil doubles wins! 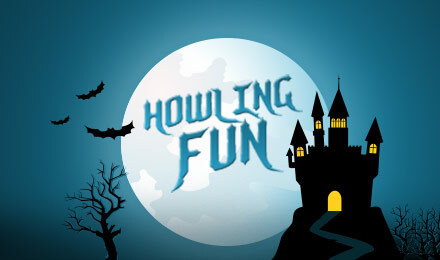 Howling Fun Slots has a spooky Halloween theme and the interface is a spooky green. It’s a twenty five pay line slot with five reels to spin and make your prize-winning combos. Across the reels you’ll find any number of gruesome characters including Dracula, the cackling Witch and the dopey Dinosaur. The Wild for the Howling Fun Slot Machine is the Devil and he replaces any other symbol except the scatters. The Devil will only appear on reels 2 and 4 and wins are doubled when this symbol is present. The first Scatter symbol is the Castle and if you find three or more across the reels you’ll win at least 5 free spins. The second Scatter is the Mummy and three or more of this symbol results in the Prize Pick Bonus where you can win extra coins. This scary slot machine is a great gaming option, comprising Wilds, Scatters and Bonus Rounds making it worth a go.